Development programs have to prove that they have had a strong and positive impact. Different types of evaluations are invaluable in showing the benefits of a program to backers, sponsors, and program beneficiaries. In the past, measuring development programs involved pen-and-paper surveys and many people. This was inefficient, expensive and time consuming, and at times it resulted in inaccurate data. The results would often only be available after months. Today, thanks to improvements in technology, monitoring and evaluation (M&E) has become digital. This has increased efficiency and accuracy while reducing costs, making it easier to conduct different types of evaluation at different stages of a program. Monitoring and evaluation personnel can now communicate the effectiveness of their program to partners, sponsors, program officers, and the community at large. Monitor and evaluate all your projects on a single software platform. Click here to learn more. 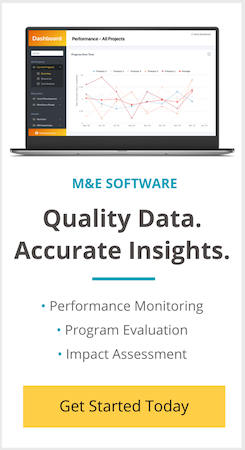 We’ve put together 7 types of evaluation that you need to know about to have an effective M&E system. Using these types of evaluation can help your program deliver better results and have a greater impact, all while reducing costs! Choosing the best types of evaluation depends on the stage at which your development program is. Each evaluation can help you make better decisions by giving you the right kind of data at the right time. Conceptualization Phase Helps prevent waste and identify potential areas of concerns while increasing chances of success. Implementation Phase Optimizes the project, measures its ability to meet targets, and suggest improvements for improving efficiency. Project Closure Phase Insights into the project’s success and impact, and highlight potential improvements for subsequent projects. The best development project will conduct different types of evaluations, constantly looking to streamline their project or program at different stages and using different metrics. Formative evaluation is used before program design or implementation. It generates data on the need for the program and develops the baseline for subsequent monitoring. It also identifies areas of improvement and can give insights on what the program’s priorities should be. This helps project managers determine their areas of concern and focus, and increases awareness of your program among the target population prior to launch. Conduct sample surveys and focus group discussions among the target population focused on whether they are likely to need, understand, and accept program elements. Is there a need for the program? What can do to improve it? Process evaluation occurs once program implementation has begun, and it measures how effective your program’s procedures are. The data it generates is useful in identifying inefficiencies and streamlining processes, and portrays the program’s status to external parties. Conduct a review of internal reports and a survey of program managers and a sample of the target population. The aim should be to measure the number of participants, how long they have to wait to receive benefits, and what their experience has been. Who is being reached by the program? How the program is being implemented and what are the gaps? Is it meeting targets? Outcome evaluation is conventionally used during program implementation. It generates data on the program’s outcomes and to what degree those outcomes are attributable to the program itself. It is useful in measuring how effective your program has been and helps make it more effective in terms of delivering the intended benefits. A randomized controlled trial, comparing the status of beneficiaries before and during the program or comparing beneficiaries to similar people outside of the program. This can be done through a survey or a focus group discussion. Did participants report the desired change after the implementation of the program? What are the short or long-term results reported by participants? Economic evaluation is used during the program’s implementation and looks to measure the benefits of the programs against the costs. Doing so generates useful quantitative data that measures the efficiency of the program. This data is like an audit, and provides useful information to sponsors and backers who often want to see what benefits their money would bring to beneficiaries. During the operation of a program, to find and remove inefficiencies. A systematic analysis of the program by collecting data on program costs, including capital and man-hours of work. It will also require a survey of program officers and the target population to determine potential areas of waste. Where is the program spending its resources? What are the resulting outcomes? Impact evaluation studies the entire program from beginning to end (or at whatever stage the program is at), and looks to quantify whether or not it has been successful. Focused on the long-term impact, impact evaluation is useful for measuring sustained changes brought about by the program or making policy changes or modifications to the program. A macroscopic review of the program, coupled with an extensive survey of program participants, to determine the effort involved and the impact achieved. Insights from program officers and suggestions from program participants are also useful, and a control group of non-participants for comparison is helpful. What changes in program participants’ lives are attributable to your program? What would those not participating in the program have missed out on? Conducting an impact evaluation project soon? Use this ready-to-use survey template and get started in just a few minutes. Summative evaluation is conducted after the program’s completion or at the end of a program cycle. It generates data about how well the project delivered benefits to the target population. It is useful for program administrators to justify the project, show what they have achieved, and lobby for project continuation or expansion. Conduct a review of internal reports and a survey for program managers and target populations. The aim should be to measure the change that the project has brought about and compare the change to the costs. Should the program continue to be funded? Should the program be expanded? If so, where? What factors worked in its favor and what worked against it? Goals-based evaluation is usually done towards the end of the program or at previously agreed-upon intervals. Development programs often set ‘SMART’ targets — Specific, Measurable, Attainable, Relevant, and Timely — and goals-based evaluation measures progress towards these targets. The evaluation is useful in presenting reports to program administrators and backers, as it provides them the information that was agreed upon at the start of the program. This depends entirely on the goals that were agreed upon. Usually, goals-based evaluation would involve some survey of the participants to measure impact, as well as a review of input costs and efficiency. Has the program met its goals? Were the goals and objectives achieved due to the program or externalities? Development programs with effective monitoring and evaluation frameworks use different types of evaluation at different points of time. Some programs might even run two different types of evaluation at the same time for entirely different purposes. No matter what types of evaluation you use, we hope you find this blog useful in making your project and program more successful and efficient! Make field data work for your organization. Register for our live webinar with Lakshay, our in-house Monitoring and Evaluation Specialist, and learn how you can use high-quality evidence captured from the field to track progress and improve the performance of all your projects. Click below to register today! My comment is that I want to know about this course because it is my major that I reading presentely. very insightful,i shall be using this in field work thank you. Your work is excellent, I have enjoyed every bit of it. Can I have a PDF or printer copy. Clear and good to understand the different types. But some evaluations seem to almost answer the same question. Is it necessary to carry out all these different types given the scarse resources? Thank you for putting this information for us. However, I would like to understand the difference between formative evaluation and baseline survey/study. I always get confused between the two. I would greatly appreciate your help. thanks to your rigorous, insightful information and astonishment hard working, I learned useful information from your post but unfortunately I did not understand when what why, and how what does it mean, kindly explain a little bit more. Concise and easy to understand! Many thanks for sharing. Really informative information, short and clear to understand. Thank you. You’re right that impact evaluation and summative evaluation are similar. One key difference is that impact evaluation can happen any time (during or after), while summative evaluation happens at the end of a program or program cycle. Also, impact evaluation also usually focuses on how the population benefited from the program (in comparison to a control group), while summative evaluation focuses on comparing the program’s benefits to its costs. Overall, they’re similar and are both ways to look at how a program is doing. They just have slightly different objectives and timings. Does that help? P.S. I’m from SocialCops and I helped out with this blog, so I’d love to know if it’s clear and helpful or not. Please let me know! Thank you very much. This has been very useful and resourceful. Printable formats will also be appreciated. Hi Dr. Emmanuel, thanks for the feedback. We’ve considered adding PDF versions of our blogs for a while, but we never spent the time on it because we weren’t sure if people would want them. It’s good to know you’d find it useful! Thanks, this is concise and clear. If formative evaluation is taken place during the Conceptualization Phase, can it be called also as ” Ex ante” evaluation ? Good question, Suthan. Technically, yes — since formative evaluation happens before the program kicks off, it happens “ex ante” (before the event). Still, it’s probably better to stick with the term formative evaluation. Ex-ante evaluation is actually its own type of evaluation. Unfortunately, “ex-ante evaluation” is used to describe lots of different evaluation activities that happen before a program starts — e.g. formative assessment, impact assessment, priority setting, budgeting, baseline surveys, and more. That’s part of why we didn’t include ex-ante evaluation in this list. Thanks. Content quit useful and practical in most field cases. I am sure many will find this useful. Please note that evaluation guru Michael Quinn Patton lists 80 types of evaluation in his book Utilization-Focused Evaluation, 4th ed (Patton, 2008), Exhibit 8.1, pp. 300-305. This book is well worth reading – one of the classics in the field. This is a really insightful post! Though it would have been more enriching if it was supported by an example of how these methods fit into a real-time program application. Thanks Toral, that’s a great point. I’ll add that to our list of future topics. Was very informative; Easy to understand.